I figured out early in my career that arguing with the market more often than not ends up costing one money. If you are one of those people who are unable to change your mind, this business will almost certainly chew you up and spit you out. Never has that been more true than today. Folks, we are in the middle of an ongoing currency war. That is creating investing conditions unlike anything most of us have ever seen before. There’s a reason why very few money managers have been able to make any profits over the last year and most of them have lost money. That reason is an ever-changing investing environment. As most of you probably already know my investing strategy is based around cycles, sentiment, a long-term bull market in precious metals, and a dash of technical analysis thrown in to help spot entry and exit points. Those tools give me a rough outline of what to expect going forward. I then place my trades based on the best odds for success. However, none of that excuses me of the responsibility to change my mind if the market tells me my expectations are wrong. It is precisely the ability to reverse direction 180° that enabled us to generate a 25% plus gain in the model portfolio during the last six months, despite being in a market that has confounded most professional money managers. Additionally, our portfolio has always been unleveraged with never more than 75% of capital invested at any one time. I daresay that, on a risk-adjusted basis, the SMT model portfolio has outperformed probably 99% of the money managers in the world. As an example let’s use my recent expectation for 2012 to be one of the worst years in history. First off, let me explain how I came to that expectation. 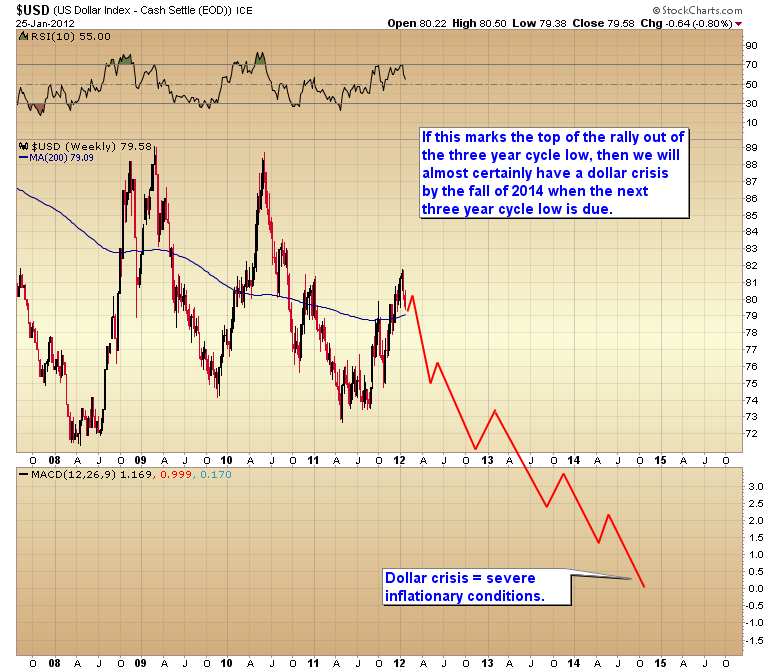 To begin with, the dollar’s three year cycle low was due to bottom in the spring of 2011. And indeed, it actually did bottom in May of 2011. 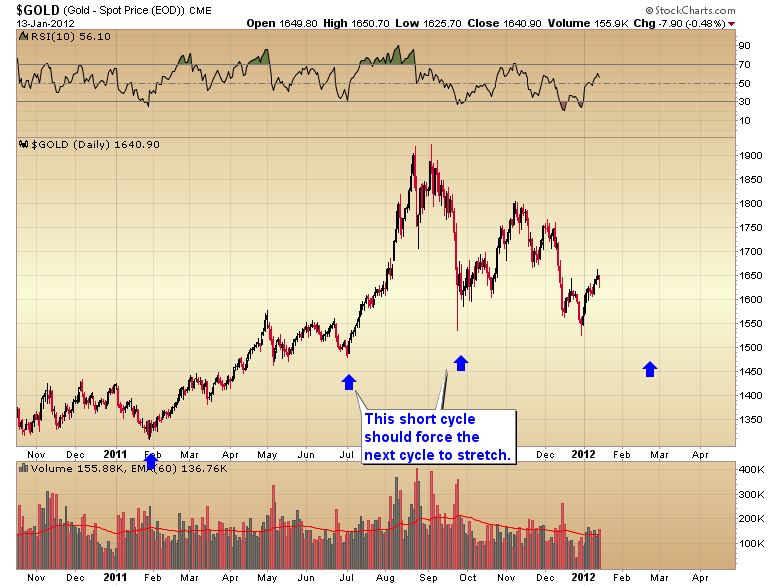 Further, the stock market’s four year cycle low is due to bottom in the fall of 2012. Since most bear markets tend to last about 1 1/2 – 2 1/2 years it was reasonable to expect that the next bear market would begin as the dollar started to rally out of its three year cycle low. 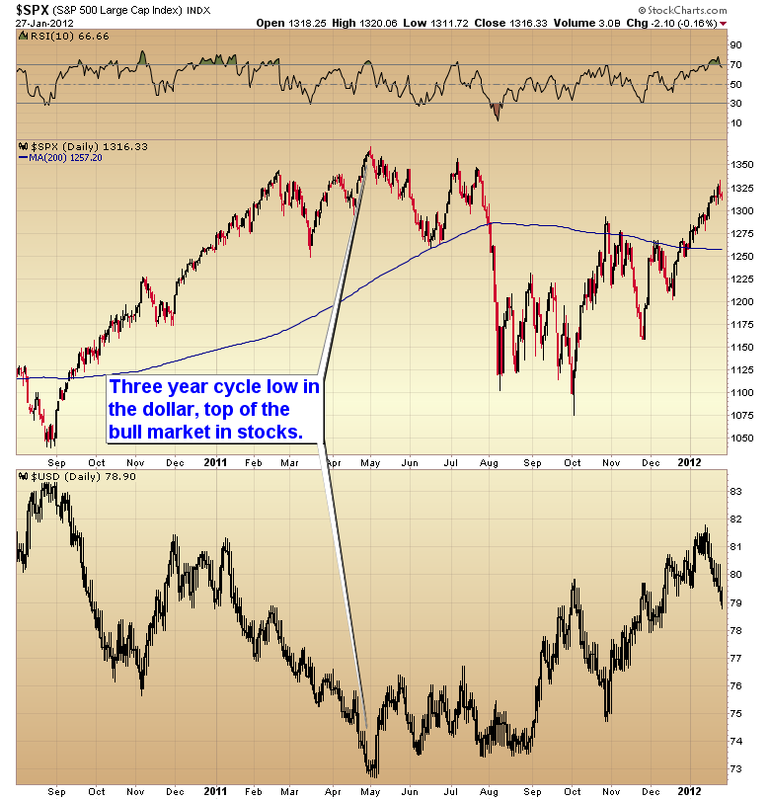 Low and behold what happened in May as the dollar cycle bottomed? That’s right, the stock market started to collapse as deflationary forces began to push the dollar higher and asset prices down. Everything was unfolding exactly as our cycles tool had suggested it would. However, in late November the markets started to deviate from our expectations. 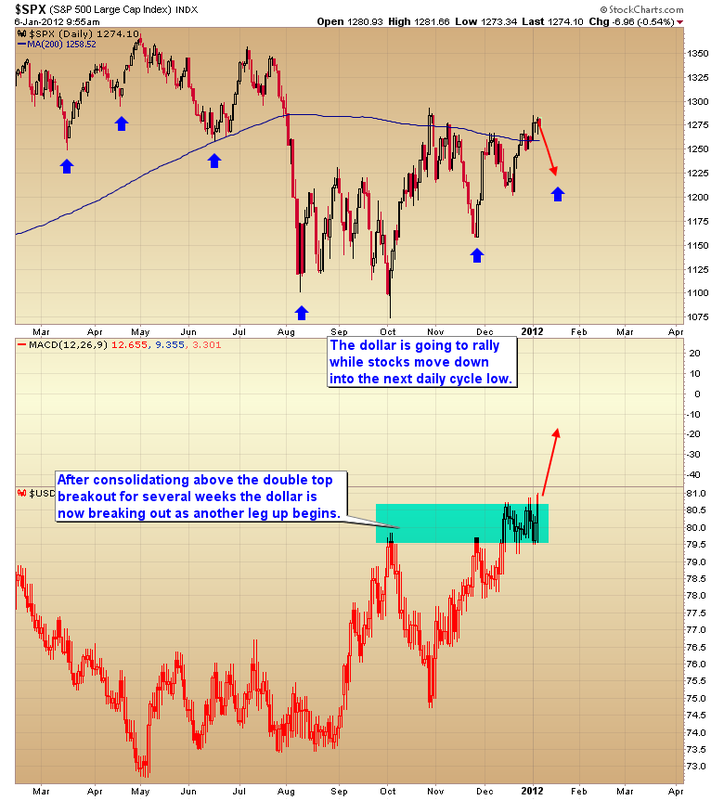 As the dollar continued to rally stocks began to decouple from the strong dollar. At this point one could either stubbornly hold on to their bearish outlook and lose money, or they could accept that the market was doing something different than what they expected, change their mind, and deal with reality as it is, instead of how they wished it to be. The fact that the S&P wasn’t doing what it should have been doing was the main reason I’ve been warning (pleading really) with traders not to sell short. 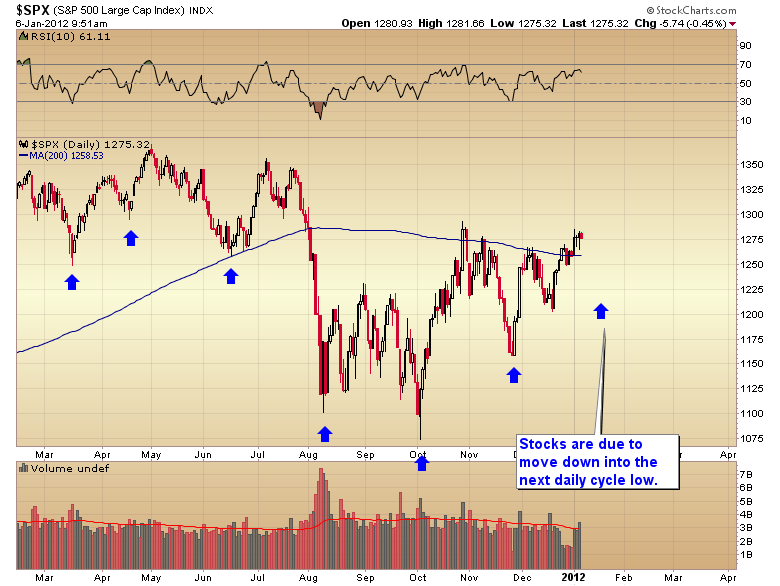 This market should have begun the move down into a daily cycle low two weeks ago. The fact that it refuses to move down into that overdue correction is sending a strong message that something else is going on. The inability to change one’s mind when the market tells you that you are wrong is one of the toughest habits to break, but one that is absolutely necessary if you are going to make money in this business. For whatever evolutionary reason, human beings have a very hard time admitting when they are wrong, and an even harder time reversing their thinking 180° even after they know they’re wrong. For the vast majority of traders it is less painful to lose money than it is to admit an error and reverse a trade. In my previous post I went over my expectation for gold to move down into its daily cycle low along with the stock market. This should have corresponded with the dollar rallying out of its cycle low. On Wednesday morning everything was set up perfectly for this to unfold. Gold had formed a swing high and was beginning the move down into its daily cycle low, stocks were in the process of reversing back down through the coil, and the dollar had bounced off of the 50 day moving average and was holding strongly above support at 80, clearly in the process of putting in a cycle bottom. However, as you can see from the chart all of that changed Wednesday afternoon on the Fed statement. The stock market reversed the early-morning weakness, closing strongly. Gold reversed dramatically, closing up over $40, and the dollar collapsed back down through 80 negating what would have almost certainly been a powerful rally out of that cycle bottom. One could either ignore what had just happened, thus exacerbating losing trades, or they could recognize that something fundamentally changed that afternoon and quickly get on the right side of the market. That is exactly what we did. When the dollar reversed and gold started to rally we immediately bit the bullet on our long UUP trade, took a small loss, and reentered GDX. None of our tools (cycles, sentiment, or technicals) were predicting this. However, that still doesn’t give us an excuse to ignore what had happened and quickly make the correct adjustment. Bernanke didn’t actually confirm QE3 Wednesday afternoon, but the market obviously perceived the Fed statement as a guarantee that QE3 is in the works. That has the potential to break the dollar’s rally out of its three year cycle low and derail the expected move by stocks down into a four year cycle low later this year. If Bernanke can break the dollar rally and get the dollar moving south again there is no way we are going to experience a deflationary bear market this year. In this scenario 2012 would be the beginning of an inflationary period, culminating in a dollar crisis at the next three year cycle low, due in late 2014. If this is what is about to unfold then we need to alter our expectations from a deflationary bear market to an inflationary bull market. The four year cycle low for stocks, instead of occurring in late 2012 would probably get stretched out to late 2014. And the recession we should experience this year will be pushed out to 2013/2014 once inflation raises high enough to poison the economy. The big question now is; did Bernanke break the dollar rally? Confirmation will come once the dollar finds its daily cycle low, and if the rally out of that low fails to move to new highs and rolls over quickly forming a new pattern of lower lows and lower highs. If this scenario plays out then we can jettison the deflationary bear market hypothesis and begin positioning for the inflationary scenario which should culminate with a dollar crisis in late 2014. 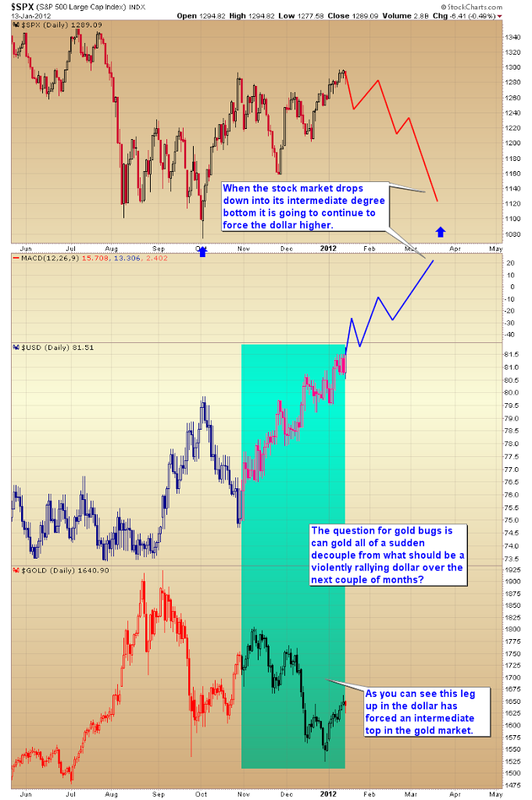 This scenario also has the potential to drive the bubble phase of the gold bull market. A lot is riding on the dollar right now. This entry was posted in Uncategorized on January 30, 2012 by Gary. This entry was posted in Uncategorized on January 26, 2012 by Gary. It has been my theory that this year we would see one of the worst performances by the stock market since 2008. However that has always been dependent on Bernanke not being able to break the dollar’s rally out of its three year cycle low. 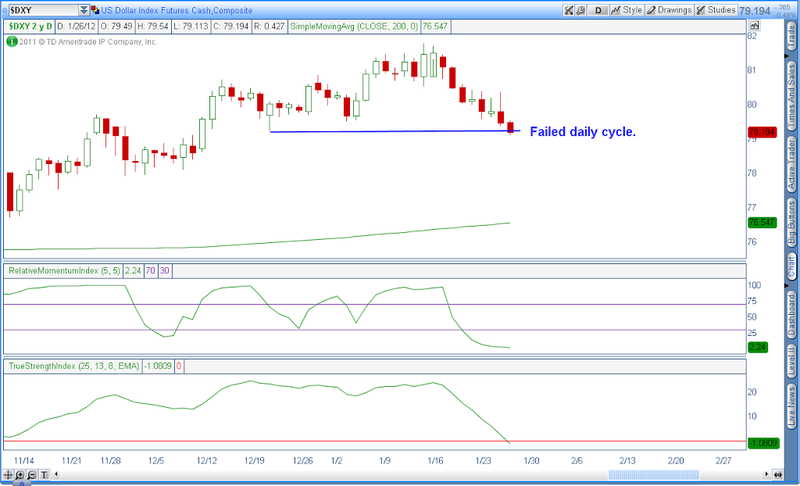 As of this morning the dollar has printed a failed daily cycle. More often than not a failed daily cycle is an indication that an intermediate degree decline has begun. I have begged and pleaded with people not too short the stock market over the last several weeks. For one it’s very hard to make money on the short side for the simple reason that markets move down differently than they move up. Now I’m going to give you another reason not to short the stock market. If the dollar has begun an intermediate degree decline then we should see it continue generally lower for the next 7 to 10 weeks. If this turns out to be the case then we are not going to see any meaningful declines in the stock market during this period. 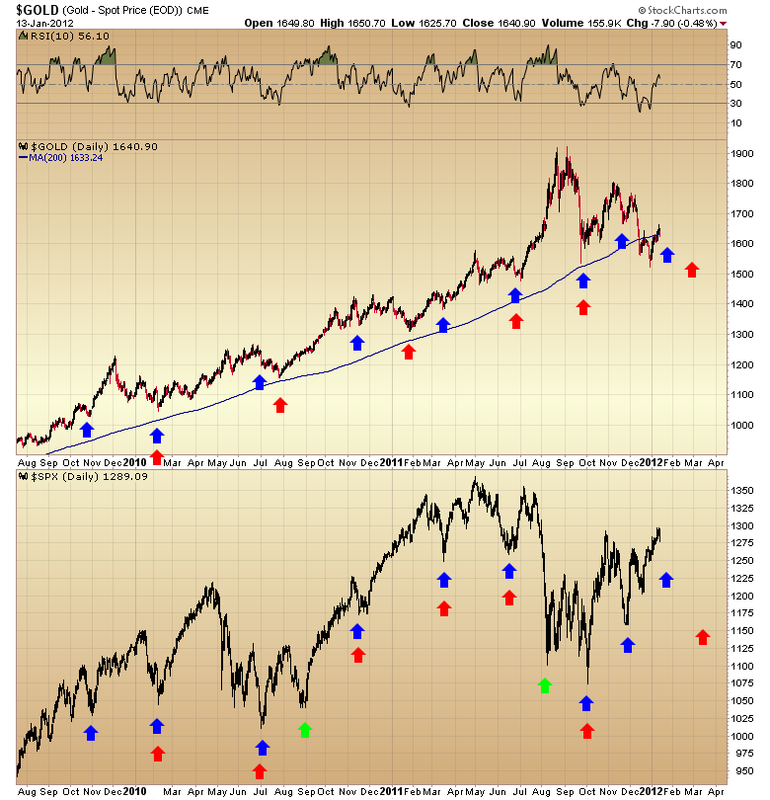 As a matter of fact the risk is great that the stock market could enter a runaway type rally if the dollar has begun the move down into an intermediate degree bottom. 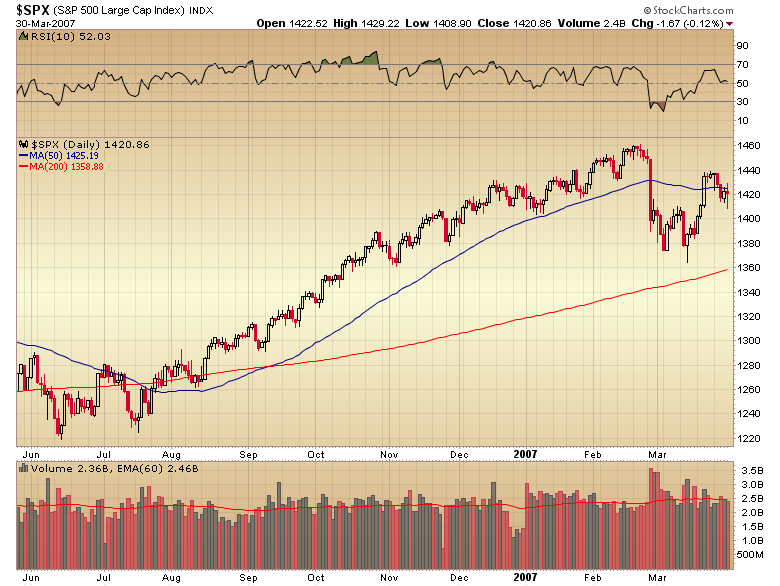 As you can see in the chart below the last runaway move in 2006 lasted almost 7 months. Runaway moves are characterized by randomly spaced corrections, all of similar magnitude and duration. As you can see in the chart above the corrective magnitude in this particular runaway move was about 20-30 points. Keep in mind we don’t have confirmation that a runaway move has begun yet. We would need to see how the first correction unfolds. If it is mild and brief, followed by the market moving back to new highs, then the odds would escalate that a runaway move has in fact begun. Another big clue will come when the dollar bounces out of its daily cycle low, which is now due at any time, and if that bounce fails to make new highs before rolling over. If that happens it will reverse the pattern of higher highs and higher lows and confirm that an intermediate decline has indeed begun. The scary part is that this may also signal the top of the three year cycle. If so then we are looking at an extremely left translated three year cycle that should generate huge inflationary pressures by the time the next three year cycle low is due in the fall of 2014. It has been my expectation that we would see another deflationary period in 2012 before the cancer infected the global currency markets. As of this morning I’m not so sure that process hasn’t already begun and the deflationary period has been aborted. Bernanke may have broken the dollar rally yesterday. If this scenario unfolds it has the possibility of generating the bubble phase of the gold bull market. I elaborated on this in last night’s premium report. This entry was posted in Uncategorized on January 25, 2012 by Gary. A potential stop adjustment has been posted to the website. It seems like most analysts, and gold bugs are now assuming that the reversal on December 29 marked the bottom of golds D-Wave decline. It’s certainly possible that we saw a bottom two weeks ago but it’s still too early to make that assumption. Gold, and most assets are about to be severely tested. How gold handles that test will be a big clue as to whether or not the correction is over. What many analysts are overlooking is the impending daily and intermediate cycle correction that is coming due in the stock market. When the stock market moves down into a cycle low, especially an intermediate cycle low, it generates a tremendous amount of selling pressure. Invariably that selling pressure bleeds into virtually every other asset class, even gold, as you can see in the chart below. Over the last two years there were only two daily cycle corrections in the stock market where gold was unaffected (I’ve marked them with green arrows). 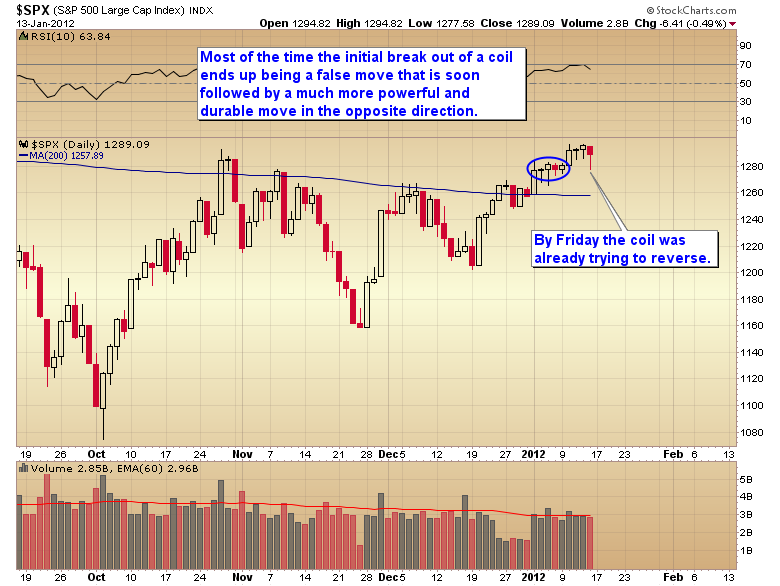 The stock market is now in the timing band for a move down into a daily cycle low. As you can see in the chart below those tend to occur almost like clockwork about every 35 to 40 days. As of Friday the stock market was on day 33. On top of that we have a larger intermediate degree cycle that should bottom sometime in March/April. 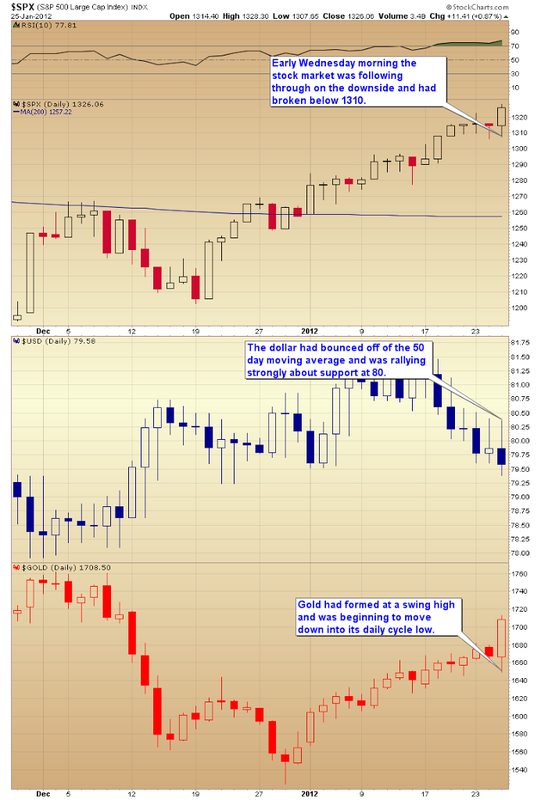 The selling pressure generated at an intermediate bottom is much more intense than a mere daily cycle low. That means sometime around the middle of March or early April things are going to be looking pretty bleak. My best guess is at that time interest rates will be spiking in France and maybe the UK (along with all of the other countries that are already having debt issues). It’s late enough in the daily cycle that there is a good chance the market began that move down into its daily cycle bottom on Friday, despite recovering most of the sell off before the close. I say that because we have a coil pattern playing out in the stock market. Contrary to what most people believe, the initial break out of a volatility coil is usually a false move that is soon followed by a much more powerful and durable move in the opposite direction. In our case the volatility coil broke to the upside and by Friday it was already trying to reverse. Once the stock market moves back through the coil zone it would be very unlikely to recover those levels until after the next intermediate degree bottom, which like I pointed out isn’t due until March/April. 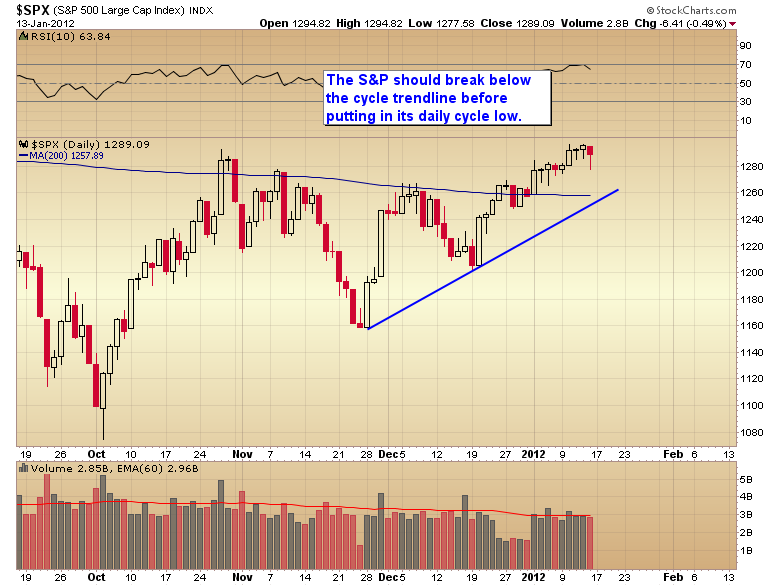 Sometime in the next 4-8 days we should see the stock market break its cycle trend line. It’s very rare for a move down into a daily cycle low not to break the cycle trend line. So for our purposes I think we can probably assume that it will. If the stock market just retraces 50% of the daily cycle advance (assuming 1297 is the top) then we should see a pretty hefty sell off in the next week or two. That kind of selling pressure will almost certainly have some affect on gold. If the D-Wave is still in progress it’s going to have a sharp affect on gold, probably forcing gold back below the $1523 December bottom. How gold handles the stock market moving down into its daily cycle low will give us a big clue as to whether the D-Wave has bottomed or not. And even stiffer test is going to occur as the stock market moves down into its intermediate bottom in March/April. If gold can’t hold above $1523 as stocks move into a daily cycle low then it is going to get driven much lower during the intense selling pressure that will be generated when stocks move down into a larger degree intermediate bottom. 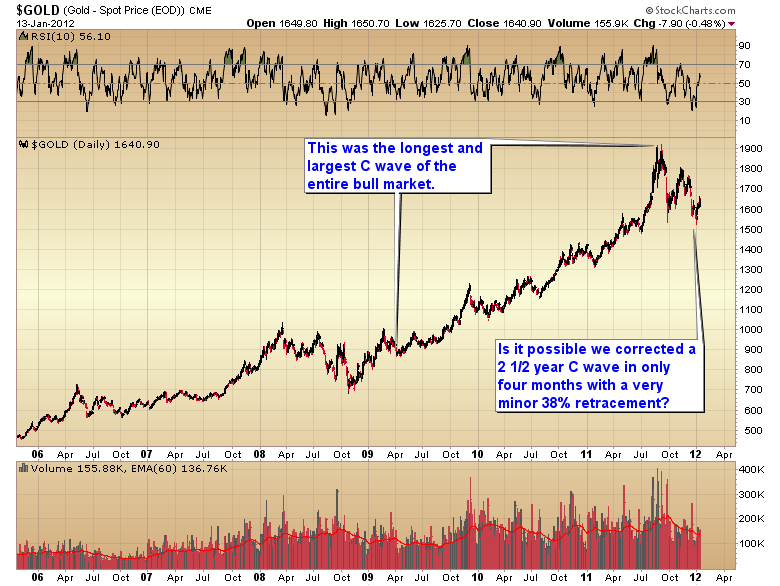 The last C-wave was the greatest in both magnitude and duration of the entire secular bull market. 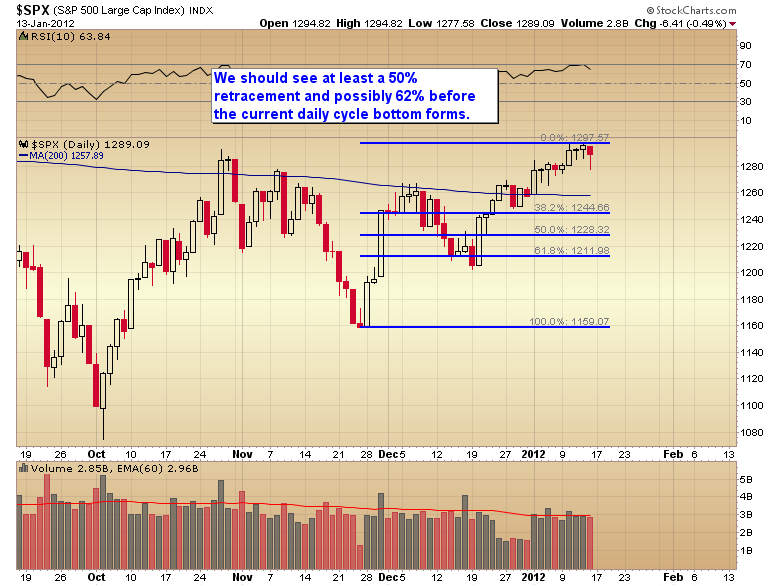 Is it possible that a 2 1/2 year, 100%+ rally can be corrected with only a 38% retracement in four short months? There is also the problem with the last intermediate cycle in gold running very short at only 13 weeks (normal duration is about 20-25 weeks). More often than not a short cycle is followed by a long cycle that evens out the next larger cycle. In this case the next larger cycle would be the yearly cycle. 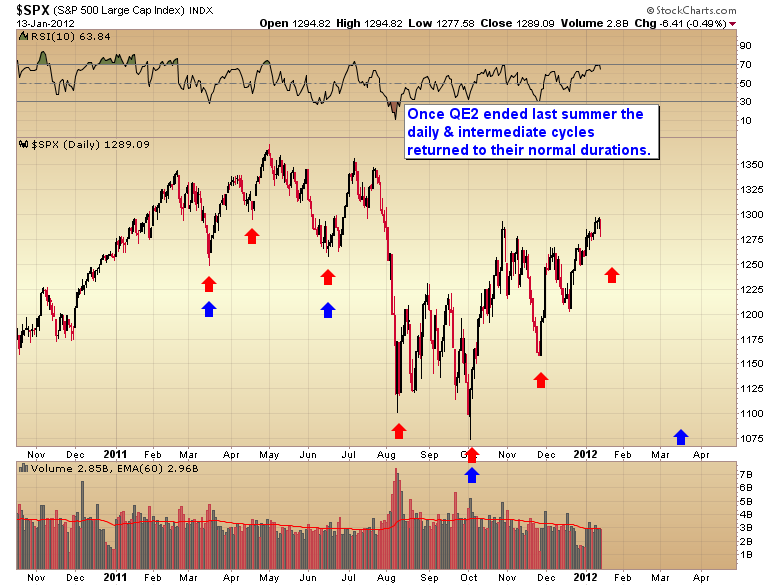 If December 29th did mark an intermediate bottom then we would’ve had two intermediate cycles of only 13 weeks each. A short cycle followed by another short cycle is a pretty rare occurrence. In this case exceptionally so because the yearly cycle low isn’t do until February/March. If I take into account nothing else I would have to assume that gold still has about 5 to 6 more weeks before the final D-Wave and yearly cycle low are formed. That doesn’t mean that gold has to drop a considerable distance below $1523. If it does turn out that gold continues lower into a more normal intermediate timing band I doubt that gold would move below the 50% Fibonacci retracement level, which is at about $1400. That also corresponds with the extensive consolidation zone in the summer of 2010. One other thing to consider is the powerful correlation of a stronger dollar whenever the stock market moves down into a cycle low. We should continue to see the dollar spike higher over the next couple of weeks as the stock market drops down into its daily cycle trough, followed by a much more powerful rise during the intermediate degree decline due later in the spring. As you can see in the chart below gold has had little ability to resist a rising dollar. So unless you think that the stock market will never drop down into a cycle low again, or that the market and the dollar will drop simultaneously (very unlikely), then gold is going to be severely tested as the dollar spikes sharply higher during the next few weeks and months as the stock market works its way down into first, a daily cycle low, and then a much more serious intermediate degree correction. Right now investors need to be on the sidelines while we wait to see how gold handles the stock market’s move down into its daily cycle low. If gold can hold above $1523 while the stock market suffers what is likely to be a rather sharp correction then the odds will improve dramatically that the D-Wave did in fact bottom in December. If however gold follows the stock market down and breaches that $1523 pivot then the odds are very high that the D-Wave is still in progress and will not bottom until late February/mid-March. 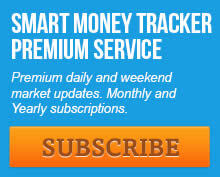 I am currently still running the one week, $10 introductory offer for the SMT premium newsletter. Since we should see the stock market form its daily cycle low sometime in the next 1-2 weeks now would be a perfect time to sample the newsletter. This entry was posted in Uncategorized on January 17, 2012 by Gary. THE PARTY MAY BE OVER! About it every 35 to 40 days we get a major profit-taking event occur in the stock market. In bull markets that’s all it is, a profit-taking event. 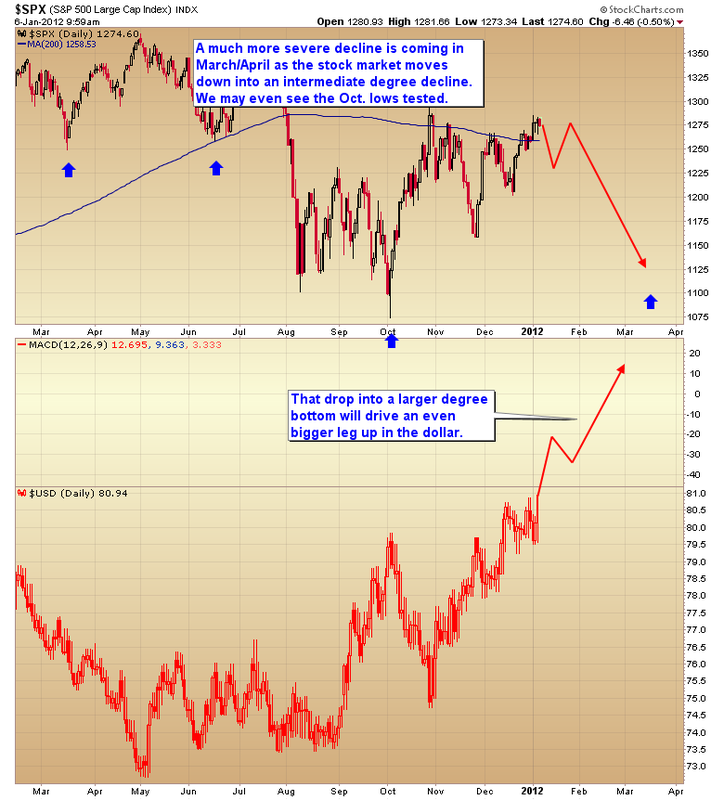 In a bear market it is a resumption of the cyclical downtrend triggered by deteriorating fundamentals. It still remains to be seen whether or not stocks have rolled over into another cyclical bear market. However we are entering the timing band for one of those daily cycle corrections. It’s not unusual to see this begin as a profit-taking event on the employment report, as we enter earnings season. As long as earnings season meets expectations then that is all this should be, just a profit-taking event. However, if earnings season disappoints then this could intensify significantly. If in addition we start to see stress in the European debt market escalate it would magnify the rally in the dollar increasing the downward pressure as stocks begin the move down into that cycle low. Let’s face it the problems in Europe aren’t going away. The cancer in the debt markets is going to continue to chew its way up the sovereign food chain until it finally reaches the US bond market. The fact that the dollar has consolidated for several weeks above the double top breakout is a strong sign that another powerful leg up is beginning. Even more concerning for the bullish case is the fact that the next daily cycle should roll over into a much larger degree intermediate decline. That would almost certainly power another leg higher in the dollar and depending on how severe the stress has become in Europe we could see the October lows tested, and even broken if this is a new cyclical bear market. The kind of selling pressure that is generated at daily cycle lows and especially during an intermediate degree decline effects every asset class to some extent. Gold will be no exception. This is why I have been warning people to wait for the daily cycle low to form in stocks before jumping heavily into precious metal positions. Gold may or may not have put in a final D-Wave bottom last week. But there is a good chance that bottom is going to get tested in the next couple of weeks. And then of course we will have to contend with the selling pressure as stocks move down into their intermediate degree decline in February and March. That could conceivably drive gold back down below $1523, although I think any dip below that level will only be marginal and quickly recovered. Right now patience is the name of the game until the stock market has formed a daily cycle low which is due sometime in the middle of January. 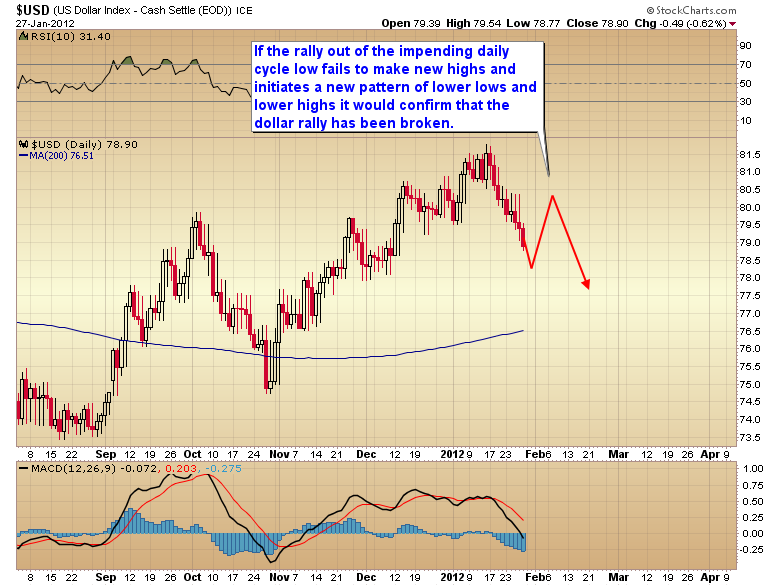 Cash or a modest position in the dollar index is safest bet for the next couple of weeks. This entry was posted in Uncategorized on January 6, 2012 by Gary. This entry was posted in Uncategorized on January 5, 2012 by Gary. This entry was posted in Uncategorized on January 4, 2012 by Gary. A portfolio change been posted to the website. This entry was posted in Uncategorized on January 3, 2012 by Gary.